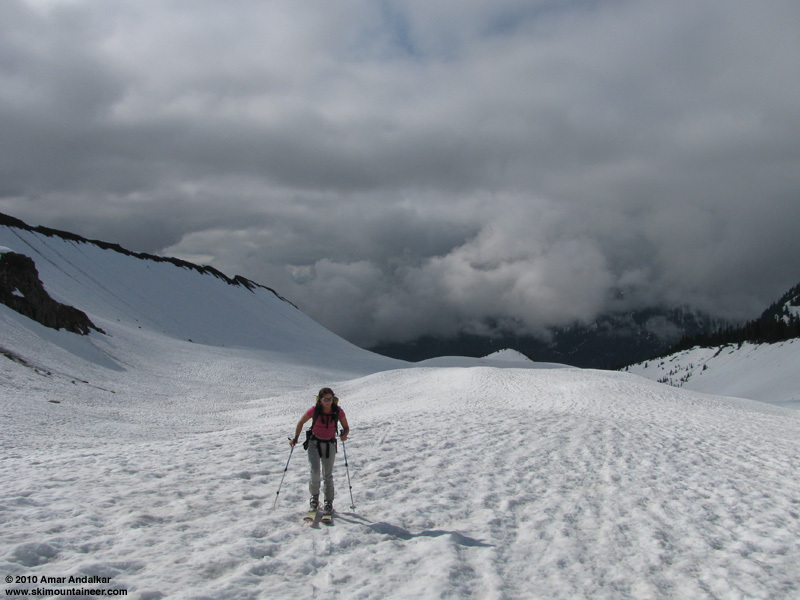 June 22, 2010, Mt Baker, Easton Glacier CORN! Well, the Washington Cascades forecast for the whole week looked like "mostly cloudy with a chance of showers", just as it has for most of this cool wet spring -- except maybe there was a hint that Tuesday might be slightly better, even partly sunny, with a freezing level of 11500 ft. Gotta jump on that chance. 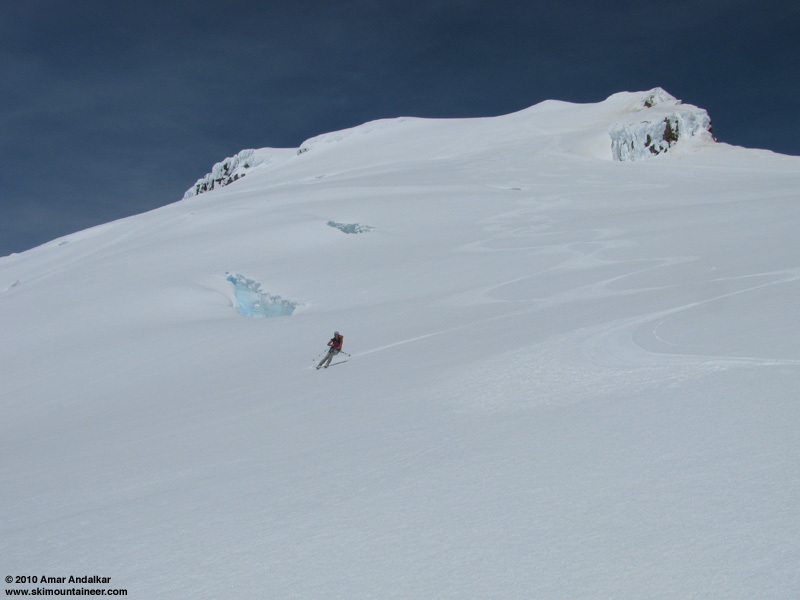 Our thoughts turned to Mt Baker, especially with Jason and the Traslins having skied Coleman Headwall recently.� Should we try to hit that? Or maybe Boulder-Park Cleaver and the Park Headwall on the east side of Baker. Or maybe just ski the easy route up the south side, which should still have continuous snow from trailhead to summit (unlike the other choices), and being south-facing also had the best chance of really good corn, given the recent snowfall above 6000 ft over the weekend which had not had much time to consolidate. Feeling a bit unsure of weather and our own speed, we picked the easy Easton. A 4am departure from Seattle had us parking at the snowmobile bridge and skinning up from the far side of it at 7am. Mostly sunny skies, much better than expected. The snow was nearly continuous across the flats down low, but much weaving and routefinding (plus skinning across the occasional bare patch or bushes) was needed to stay on snow -- it won't be skinnable there for much longer. Approaching the open floodplain of Rocky Creek, the snow became even more sparse and we were forced to backtrack from a dead end beside the rushing creek, heading instead to the far right (east) side and managing to find barely continuous skinnable snow up the rest of the drainage.� Above 4500 ft, the snow becomes much deeper and more continuous as long as you stay far right (near the eastern lateral moraine), although the surface is very lumpy and bumpy with incipient suncups. Meanwhile, a solid cloud deck was forming all around and seeming to chase us up the mountain, ominous perhaps? Hopefully it was just a marine layer which would be solidly capped and not rise to engulf the upper mountain. By 6000 ft, the snow had become much smoother, with the recent snow feeling well consolidated underfoot and eventually being almost perfectly smooth but for the numerous trails of deep postholes from weekend climbers, along with a lone gently-switchbacking skin track. 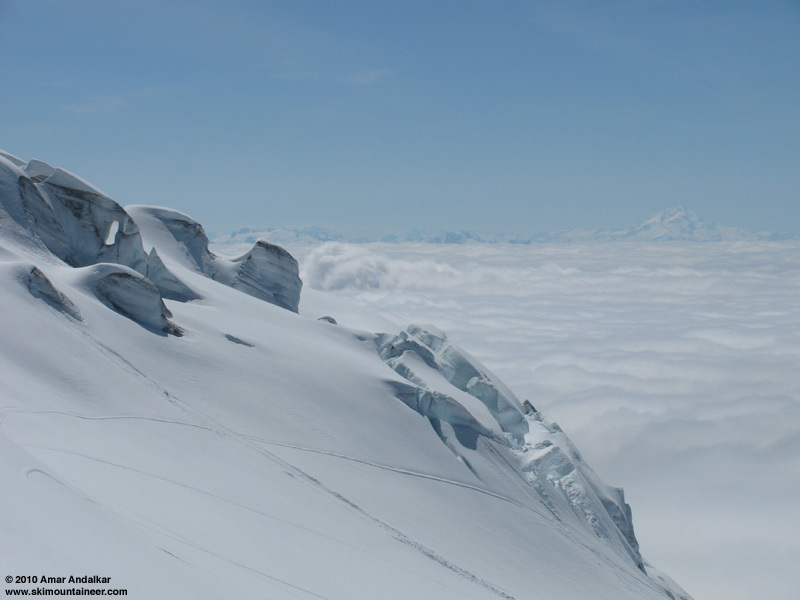 We soon ascended past the edge of the cloud deck and enjoyed the glorious warm sunshine above the classic Cascades "sea of clouds", with only mountaintops visible as islands. To the southwest, the tip of the 7000+ ft South Twin stayed above the cloud deck all day, while 6640+ ft North Twin remained hidden below sea level. Sunshine and solitude and strawberries, an easy pace with an occasional relaxed food break, no other people on the route and no more snomos either. A light SW breeze helping to keep the heat away. 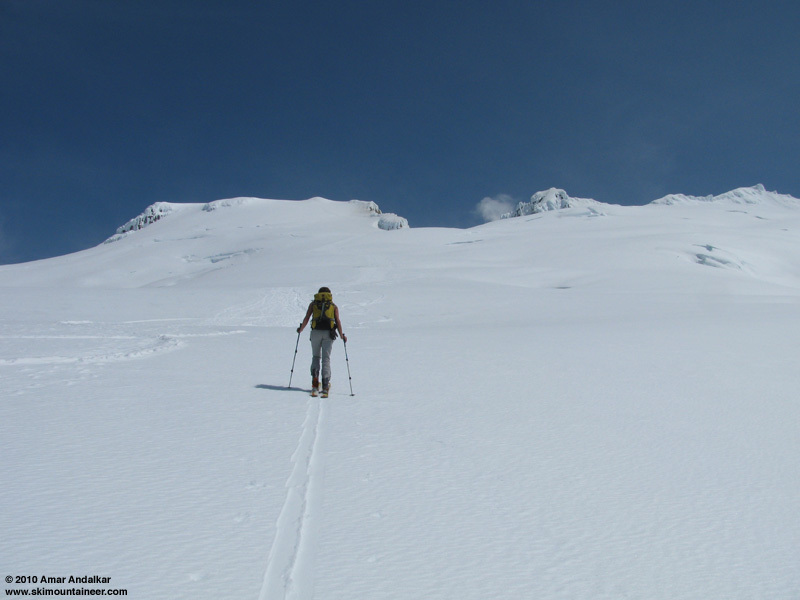 Gliding up the gentle glacier on grippy sun-warmed corn, the route still in excellent shape on the first days of summer with minimal crevasse hazard and no routefinding issues. 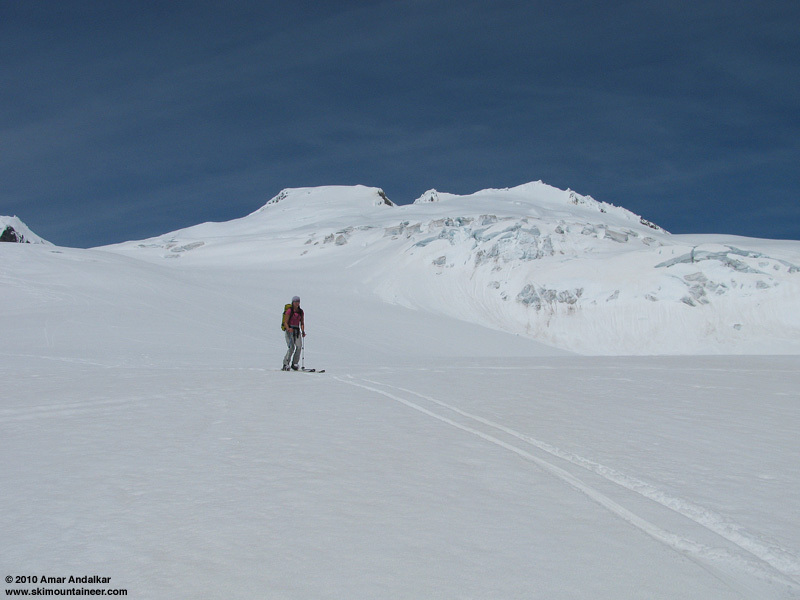 The Roman Wall went easily on skins, the snow underfoot seeming near-perfect for both skinning and skiing, and we crossed the dome to arrive atop the summit of Grant Peak by 1:45pm. The gentle breeze focussed into a strong and cold wind atop the narrow summit, but relief and warmth could be found just a few feet below on the lee side. 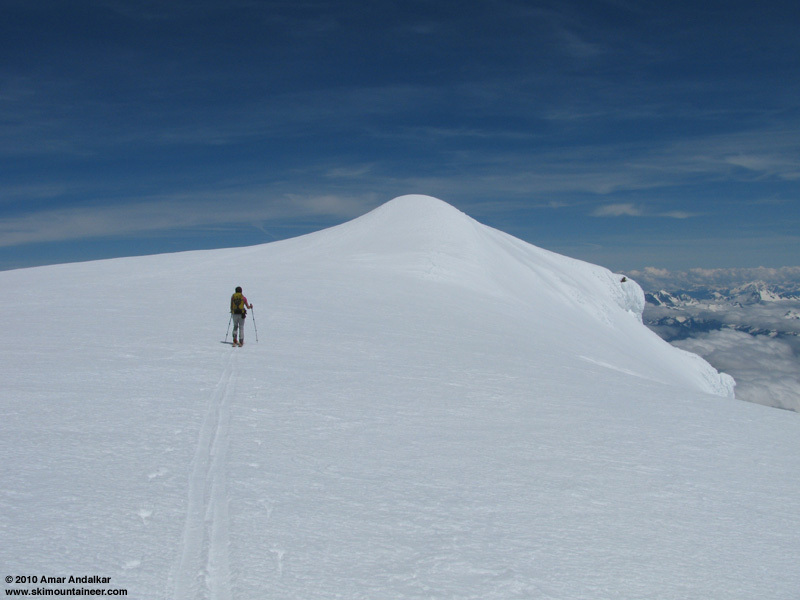 Skied off the summit after 2pm, smooth and corned all the way from the tip-top and across the edge of the summit dome, with none of the icy sastrugi so typically found there. Dropping the rollover onto the Roman Wall was amazing: absolute perfect ripper corn down the entire face, and continuing to about 8000 ft, so easy to get going dangerously fast. Perhaps the best snow conditions I've ever seen on the Roman Wall (and by far the best on the summit dome and Grant Peak). The intense solstice sun had shone too much below 8000 ft, with conditions over-softened as expected, but still very good down to 6000 ft. Then the usual sticky bumpy ride below that, a small penalty to pay for the outrageous goods above. Below timberline near 4500 ft, we followed a gully dropping east of the Rocky Creek drainage, hoping to find more continuous snow than we had on the ascent. It sort of worked, but one creek crossing on foot and numerous side-stepping hijinks on skis were needed nevertheless to reach the flats below the gully. The strong afternoon sunshine had perforated the cloud deck by now, keeping skies mostly sunny for us even down low. Much weaving through the rapidly melting snow patches brought us on skis to within 200 yards of the snomo bridge. An outstandingly nice day on a stunning mountain in spectacular weather. 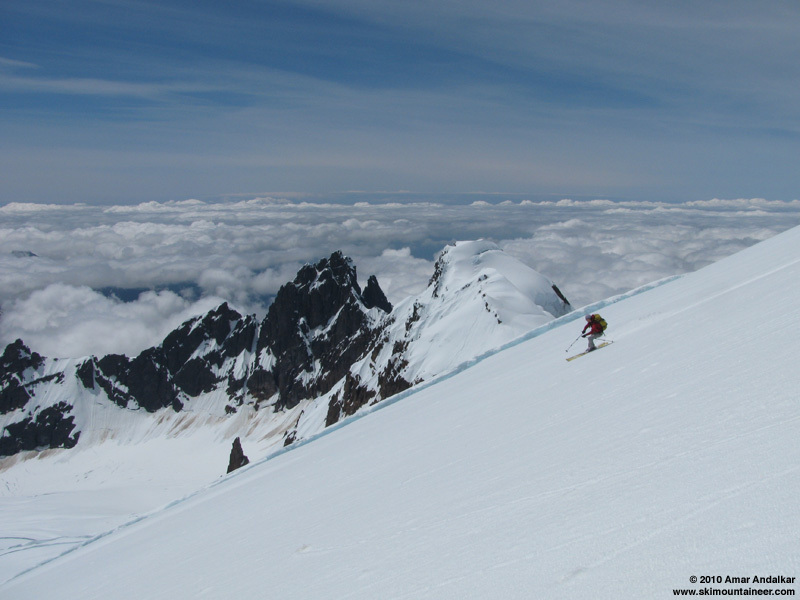 Nearly 7500 vert of ski ascent and descent, including nearly 3000 ft of the type of corn that summertime skiers dream of. Re: June 22, 2010, Mt Baker, Easton Glacier CORN! Thanks for the report. great images! Oh man, I was feeling so over skiing before this trip; it was exactly what I needed to fix my attitude. Thanks for a great day, Amar. Thanks for the report! Have a trip planned for this weekend, so this really helps. Bandwith nazi is going to get you.